The Fahrenheit Group is proud to announce we have again been named as one of the Best Places to Work in Virginia for the 5th consecutive year. This annual list is broken into three categories: small, midsize, and large employers. 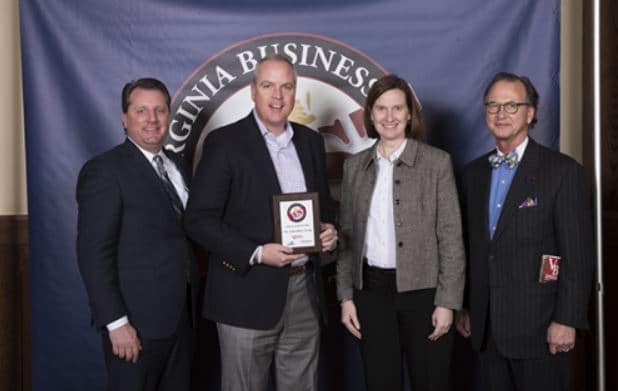 This year marks the eighth year that Virginia Business has compiled the list in cooperation with Pennsylvania-based Best Companies Group. Each year the Best Companies Group makes its selections based on a two-part survey process conducted with the companies and their employees. The employee surveys are used to benchmark companies on a list of core values: leadership and planning, corporate culture and communication, role satisfaction, work environment, relationship with supervisor, training and benefits, pay, and overall engagement. This year they had 175 entrants from throughout the state of Virginia who were all vying for a spot on the coveted list. Only 100 of those entrants were selected. The final ranking was announced at an awards luncheon in February at the Boars Head Inn in Charlottesville. For the complete article in Virginia Business, click here.